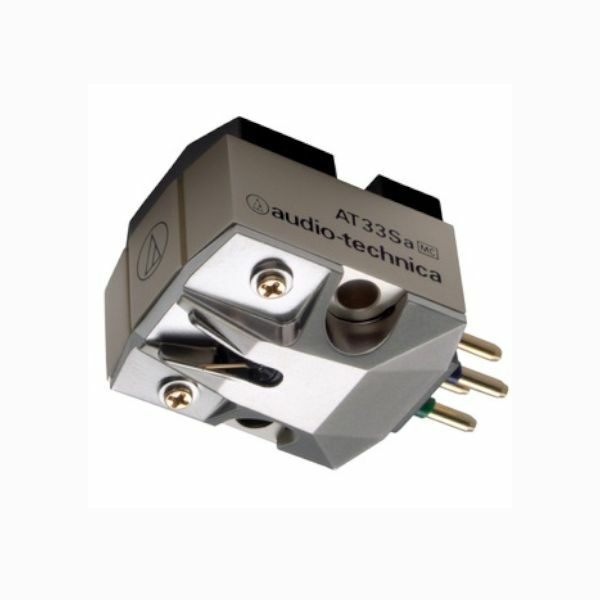 The AT33sa is the first Audio-Technica MC cartridge model to feature a Shibata stylus. In addition to its superior high-range performance as a line-contact stylus, the Shibata stylus produces mid and bass sound that is strong and rich. The Shibata stylus is mounted on a boron cantilever with a double damper to greatly improve sound quality. The AT33sa uses a tapered boron cantilever. Tapering the cantilever and revising the number of coil rotations reduce the weight, giving the cartridge better high range performance and wide range reproduction. The model uses a neodymium magnet with maximum energy product BHmax of 50 [kJ/m3] and a permendur yoke with high saturation flux density and outstanding magnetic properties, which further enhances the concentrated magnetic field of the coil gap. The basic structure is an original MC type, with separate cylindrical coils to the left and right channels. Since power is generated independently in each of the left and right channels, this structure offers truly superior separation. If the signal from the opposite channel escapes, this can cause intermodulation distortion and have a decisive impact on audio quality and how the stereo sound spreads. The structure of this product ensures a clear and smooth sound. 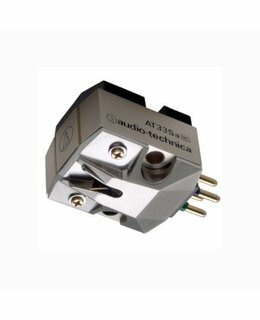 Additionally, the two coils have a reverse-V shape which reduces effective moving mass as seen from the stylus tip, limiting unnecessary movement of the coil and further eliminating distortion. The VC mold that affixes the coils is made with hard synthetic resin containing potassium titanate to make it highly strong and rigid. This improvement results in a lighter product, which reduces unnecessary vibration. The product’s housing is made of precision-cast hard aluminum alloy. Hard synthetic resin sandwiching in the structure on the top and bottom suppresses parasitic resonance. This minimizes unnecessary noise while enhancing rigidity and the signal-to-ratio.